Monocomponent epoxy primer in watery dispersion. - Adhesion-promoter for class C2 (EN 12004) cement-based adhesives and leveling mortars on non-absorbent substrates, such as: ceramic tiles (glazed bricks, polished stoneware, etc. ), stone materials, PVC, linoleum. - Treating absorbent1 or fairly absorbent surfaces, such as: concrete, cement-based screeds, gypsum2, plasterboard, anhydrite2, wood and chipboard before applying adhesives, skimming plaster or cement-based self-levelling mortar. 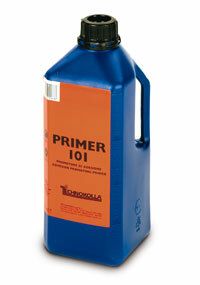 1 Dilute product with water in 1:1 ratio for use on absorbent substrates. 2 When PRIMER-101 is applied, the residue humidity in the gypsum-based substrates described above must be less than 0.5%.